‘I experienced that sinking feeling you get when you know you have conned yourself into doing something difficult and there’s no going back.’ So begins Robyn Davidson’s perilous journey across 1,700 miles of hostile Australian desert to the sea with only four camels and a dog for company. Enduring sweltering heat, fending off poisonous snakes and lecherous men, chasing her camels when they get skittish and nursing them when they are injured, Davidson emerges as an extraordinarily courageous heroine driven by a love of Australia’s landscape, an empathy for its indigenous people, and a willingness to cast away the trappings of her former identity.Tracks is the compelling, candid story of her odyssey of discovery and transformation. 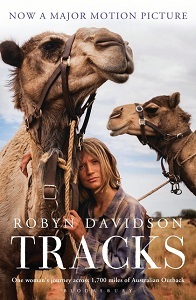 Robyn Davidson was born on a cattle property in Queensland. She went to Sydney in the late sixties, then returned to study in Brisbane before going to Alice Springs where the events of this book began. Since then she has travelled extensively, has lived in London, New York and India. In the early 1990’s she migrated with and wrote about nomads in north west India. She is now based in Melbourne, but spends several months a year in the Indian Himalayas.